Another Fringe show to tick off my wish list for this year. The Noise Next Door are an improv group whose show is made up of lots of sketches and songs. 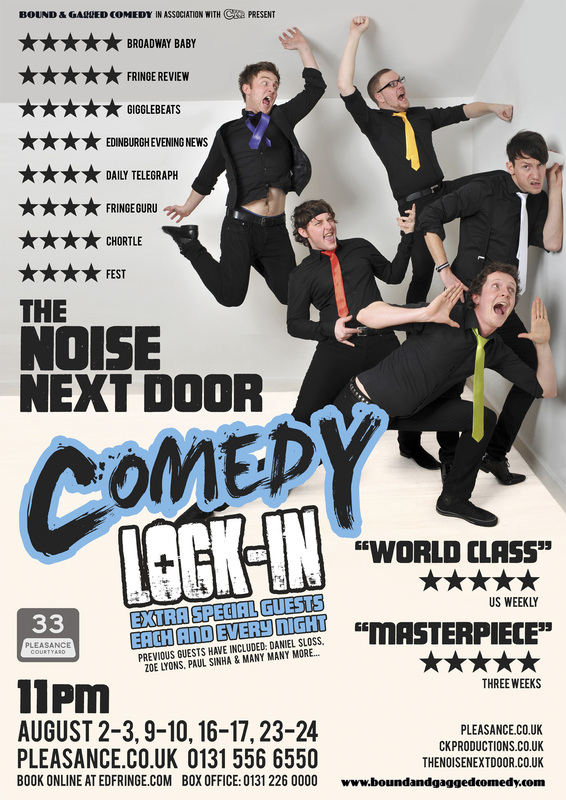 I saw them last year, when they had 2 shows, their main one (‘Soundhouse’) and their comedy lock-in. I saw ‘Soundhouse’ so this year it was the lock-in’s turn, and having thoroughly enjoyed them last year, I had high hopes for the show this year as well. Fortunately, I was not disappointed! I’ve found that there are some great improv acts out there, and others that aren’t quite as good. The Noise Next Door are excellent, in my opinion, as they are constantly taking audience suggestions, from fairly normal to entirely bizarre, and creating something hilarious from them. The quick-thinking required in improv is there in abundance, along with the degree of intelligence needed to make something out of even the most obscure references and suggestions. The nature of their show, involving lots of short scenes, means that audience suggestions are taken almost continually (unlike other shows who create a longer story from only a few contributions at the start) and therefore proves that they are coming up with everything entirely on the spot. The other great thing about improv is that you’ll never see the same show twice. Obviously there has to be some loose formatting and ideas behind their sketches, so I found myself recognising some of them, such as the skit involving one member being glued to something. However, the suggestions are entirely different every time so I found that this didn’t matter in the slightest. I also like that they use songs in the show too, which must be even harder to make up on the spot, and there’s even a live guitar to prove that they really can stay on their toes. The unique thing about their lock-in is that every night there are two stand-up comedians in as guests, who each perform a short set and then take part in some of the games and sketches. This is a great way to discover new acts you may not have gone to see otherwise, but as everyone’s tastes differ it can be a bit of a hit-or-miss scenario. The night I went they had Romesh Ranganathan first, who I’ve seen before on Mock the Week, and who I think is good but is certainly not one of my favourite comedians. Then, there was Marcel Lugont, one I’d never heard of before, but rather enjoyed. He perpetuates the French stereotype, and seeing as myself and my friend are both French students, we found this hilarious. The improv skills of different guests will also vary, but I thought both guests coped rather well. Overall, I found myself in fits of laughter for the entire show. It was strange and crazy at times, but, like the performers themselves, no one ever knew what was coming next. I would highly recommend it, and most definitely go back to see it again if possible. Hilarious every time.